It's no secret that I prefer to shop on the Internet, than in "real" stores. One of the reasons for that, is that it's easier to find the things I want, on the 'net. If there's something in particular I'm looking for, I like to search around, read reviews, etc, which made me realize that I want to write my own reviews, too, here, on my blog. So, from now on, reviews will be tagged with "Reviews", so it will be easy to find. You could also search the blog, if there's something you're looking for. 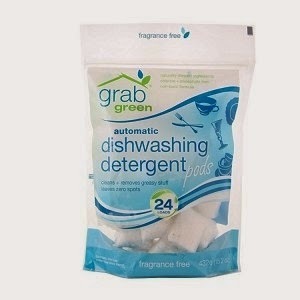 So, first up will be a short review of a dishwasher detergent. We've been having problems with the detergent recommended in the manual for our dishwasher, the dishes sometimes looks "sandy", even when the filter is clean. So I looked up GrabGreen on iHerb, and tested one bag. Shiny clean dishes! Then we went back to the last bag we had of the "recommended" brand, and oh, what a pain! I have to clean the filter more often, and there's still "sand" on some of the dishes. So, I have now bought a new bag of GrabGreen, and will also test Ecover. If you want to try this detergent, too, or any other products from iHerb, use the code QEX019 to get discount on your first iHerb order. Orders of $40 or more receive the maximum $10 discount, while smaller orders receive $5 off.